A low-cost technology to detect counterfeit electronic chips will be put through its paces using a database of fake samples. First unveiled earlier this year, the Barricade technology developed by non-profit firm Battelle is designed to allow non-destructive verification of integrated circuits (ICs), preventing falsified components ending up in electronic devices. Battelle has agreed access to an inventory of advanced counterfeit and clone device test samples put together by electronic parts distributor SMT Corp that will be used to test the capabilities of the Barricade system. According to Battelle, Barricade "enables … verification of 100 per cent of components for pennies per part at throughputs of seconds per part without integrated circuit design modifications, physical alterations to existing inventory, or any changes to electronic component manufacturing processes." 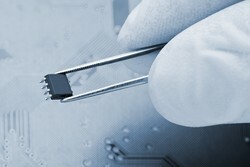 The technology combines hardware and software to collect, analyse and classify the power consumption waveform from each component, creating a unique signature for the IC, and is suitable for both analogue and digital devices. Data compiled by IHS - reported in 2012 - showed that analogue ICs accounted for just over 25 per cent of reported incidents of counterfeit semiconductors, followed by microprocessor ICS at 13.4 per cent, memory ICs at 13.1 percent, programmable logic ICs at 8.3 per cent and transistors at 7.6 per cent. Only a few identical devices are necessary to enrol an entire class of chips into the system. The process can be performed at any point in the supply chain to greatly reduce the risk of counterfeit/clone component entry as well as to address new regulations that may arise for anti-counterfeiting, said Battelle. Stylianos Kaminaris, director of cyber product development with Battelle's Cyber Innovations group, said that the deal would allow the project to move "beyond the R&D phase and towards a real-world, scalable test solution." The annual market of counterfeit products in these segments was about $169bn in 2012, according to IHS.